Firstly thank you to all those that downloaded the wonderful nOCD app! I told you it was fab didn’t I?! Not only did I love sharing the app with you but I really enjoyed hearing your feedback on it and talking all things OCD. 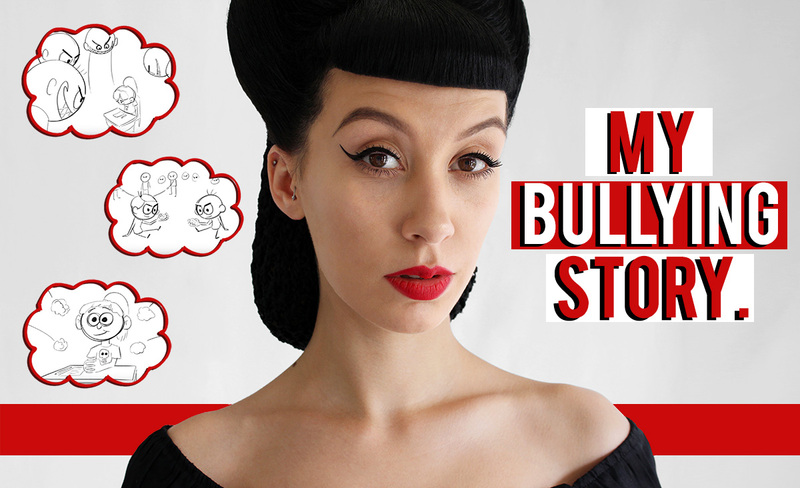 This week on the blog were going down a completely different route and I’m going to be talking to you about bullying! Ergh, can we not talk about something else?! They’re everywhere aren’t they? From school bullies right through to work bullies. My first real introduction to a bully was in the form of a young girl at primary school. My word did she terrify me. Looking back I cant figure out how she got to the place she did. Normally its the popular ones that have an army behind them but this kid was kind of a loner and was quite happy doing it without the support of others to help her along. She was a nasty little beast. A nasty little beast with huge anger problems from about 5 years old onwards. I still can remember how she use to throw things at me, pull me off my chair and call me all the names under the sun. I even remember at one school nativity where she stole and hid my costume, the little toad! Primary school was tough at the time and all those things that seem so little and silly now had a huge effect on me. Though all that seemed big then, nothing was going to prepare me for what happened at secondary school. My secondary school was known of as a bit ‘well to do’, a bit posh and a place where you sent your kids when you had hopes and dreams of them becoming doctors, lawyers and multimillionaires. All I wanted to do was make comic books and lets face it my mum had no hopes nor dreams for me. Most of my days were spent hiding and id make the odd appearance for an art class. When I did id no doubt be faced with name calling, pushing and shoving and it would be a pretty rare occasion to have a bag intact as id often have the straps cut on it and all my work tipped out and ripped up. I guess at first I kind of had the same sort of experience that I had at primary school. It started with the names and pushing and shoving but this time things went to a very dark place. The first occasion I remember when things got serious was when some girls spray painted and drew on the walls of the girls bathrooms. No no, not a small picture on the back of a door this was the WHOLE BATHROOM. Whats this got to do with me you ask? oh they blamed me for the whole thing and I knew that because they told me they’d done it and also told me id been blamed for it. I mean I loved art, but come on! I don’t want to say this but I was almost impressed at the pure skill they had to of covered as much of those bathroom walls as they did. It was everywhere. I can still picture it now. The dark black marker the drawings and the name calling and comments of people that were all in my classes. As I was so terrified back then not only of them but just of life in general,I kept my mouth shut. I didn’t say it wasn’t me and I didn’t say it was and with that the conclusion was made that it was me. I guess what made it only more tricky was that I didn’t have that support at home to back me up. In fact the person that I did have at home lavished in every second of what had happened and not only found it to be the joke of the week but ended up paying out of my savings for the bathroom to be repainted. Many occasions happened with things from teasing right to more serious situations but the final straw for me was a real kick to the back of the knees and was something that just went too far. Id become friendly with a small group of girls which was weird as my first experience of them wasn’t the best. However, they had decided to become remotely friendly and lets face it i was all for anything that wasn’t wasn’t how i was normally treated. One day i noticed things had started to vanish. Either from my school bag or at home. Part of me didn’t mind too much, i mean maybe id misplaced them or someone had just borrowed things without me knowing. After a while of it happening i was kind of curious just to find out which was a massive step as id spent most the ‘relationship’ doing everything by the book as I was terrified of upsetting the situation. Id brought it up with one of the girls that i presumed it must be and nothing much came of it. It was sort of a ‘oh thats weird’ and the whole thing was brushed off. Low and behold by the afternoon there was rumours going round that I had been taking things from one of the girls id originally questioned. You probably can guess how this is going to go but within what seemed like hours it was the talk of a good 90% of the school. The things that were passed around were RIDICULOUS. I mean if i didn’t find the whole situation quite so upsetting id find it funny. These were everyday house hold items even to bits of furniture. It didn’t matter what these things were and people weren’t going to say “Hang on, are you sure?” This was a rumour that was about the weird kid at school and no matter the situation.. It was going to be passed on. I was beyond heartbroken and the whole situation was again made worse by my mother who had given the girl in question money to repurchase the things that had apparently been taken. Low and behold more people started coming forward and saying it had happened to them too and within no time more money was handed out to more people. It started as a small rumour that could of possibly calmed down by itself but was only fed into by my mother which made it grow and grow. After this I left school and I was not going back. No siree. Not.a.chance. Infact this whole thing was what brought me to my first suicide attempt. School was bad, home was worse and I had no where to go and no escape away from it all. I couldn’t deal with the daily torment especially when it seemed to be feeding my mothers behaviour as she lavished in every second of it. Bullying is an awful awful thing and has such mass impact on the victim. Though a lot of my therapy and recovery process came from my abuse, the bullying I suffered had a great impact on me and how I perceived the world too. I guess an interesting point is shortly after i started secondary school i found out that the main bully at my primary school had been having a pretty rough time at home. In fact, by the time she got to secondary school she was the weird kid and was often known to throw herself on the floor and pretend to faint to stop the bullies targeting her. The leader of the pack at secondary school? Well she was from a pretty broken home too. I was made to feel a lot lower than the bully or bullies. That I was some weakling with all these faults that made me so easy to pick at. They seemed so loved by so many and that it had to be me with the problem. In fact I couldn’t of been more wrong. Bullies usually have poor self esteem and are more broken than we could ever see at the time and the army behind them is often just as broken. They get high satisfaction from others hurt and torment which only feeds them to continue bullying. Oh being from a broken home is no excuse by any means but it just shows how much broken people have such an impact. All these broken people that I had in my life showed what I didn’t want to be. That my trauma wasn’t going to be someone elses too. Oh and by the way, most bullies involved have since apologised and admitted things went too far. Over 3.2 million students are victims of bullying each year. The most common types of bullying are verbal and social bulling for example; spreading rumours or embarrassing someone. 1 in 10 students drop out of school due to bullying. Have you had any experience with bullying? or have you had a difficult situations that lead to you not being so great to others? Taking on OCD with nOCD!